I feel that I can’t do certain things that have sent to me, scripts, because I think that really – I’ve been June Cleaver for so many years, because we went back, you know, and we did – 20-year hiatus we had – and we went back and made 105 new ones. And so I really feel very strongly that there are certain things I won’t do. People stopped me on the street and said ‘I can’t live up to you.’ Of course, they’re referring to June Cleaver. I have to tell you that June Cleaver had a job in ‘The New Leave It to Beaver.’ She did. Sure, she was a council woman. She went to work. She wasn’t a sit-at-home grandma. She went out, got a job. 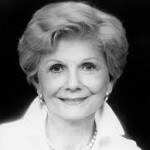 Barbara Billingsley was an American film, television, voice and stage actress. She gained prominence in the 1950s movie The Careless Years, acting opposite Natalie Trundy, followed by her best known role, that of June Cleaver on the television series Leave It to Beaver 1957–1963 and its sequel Still the Beaver. Billingsley fell in love with drama in the second grade, and during her years at George Washington High School in Los Angeles, she performed in all the school plays. She was voted "Class Queen", and graduated from George Washington in 1934. She used the name Barbara Combes until 1941, when she wed her first husband, Glenn Billingsley. At that time, she began to use Barbara Billingsley. Billingsley died of polymyalgia at her home in Santa Monica, California, on October 16, 2010, at the age of 94. She is interred at Woodlawn Cemetery in Santa Monica, California.